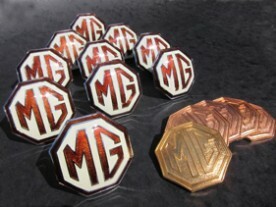 Over the past couple of years Vintage MG Parts have been working on changing the colour of the brown / cream badge back to its 1930s factory standard colours. For some unexplained reason, the brown & cream reproduction radiator badges have for years been made for the MMM trade with a varying dark brown, sometimes being so dark, its opaque. The colour was being marketed as a "rich brown" (see image below left). The original badge was more of a golden brown and clearly showing the base mottling. During 2011, VMGP set out to rectify the problem working with our enamelers on colour adjustment and experimentation with different base material backings (see image above and below right). We have been at the forefront in lightening this original tooling manufacturied badge. In addition, VMGP have individually reworked the blank stampings to include reprofiling to improve the seating of the badge against the radiator shield. During our badge lightening exercise, we were using an early original MG radiator badge to colour match. Sadly, the colour we can now offer, is still not quite to the original colour match but is as close as the trade will manage to achieve. The amber pigment is one of the most difficult colours to now replicate due to stringent import regulations relating to the banning of essential colour additives to include cadnium and uranium. This badge is also correct for the TA, TB & TC as well as Y Type and SVW models. Although more recognisable as being the radiator badge, it is also used on the P, L, N, KN and K Type (non-supercharged) front aprons as well as on the spare wheel carrier for the F2, J2, J3, J4 and L2 models.